1- Flowers that ship/preserve the best are roses and carnations. As for colors, red flowers tend to darken and white flowers tend to get an antique coloring, otherwise most other colors do fine. 2- The sooner we get the flowers the better. The fresher the flower, the better the outcome of the keepsakes. But remember, even if the flower isn’t perfect, it’s still your flower. You do not need to overnight them, you can ship them regularly through the USPS. Please do not request a signature when delivered. 3- Please cut off the stems of the flowers as we do not need the stems or leaves. Be sure to leave about 1/2 – 1″ of stem still attached. If you cut the stem too short the flower will fall apart. 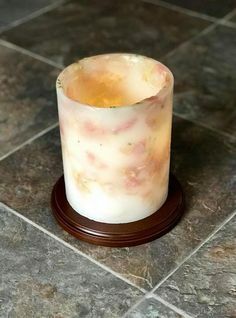 4- Place the flowers into a sandwich size Ziploc baggie, gallon size tends to be a little to large and you then tend to put too many inside, and DO NOT seal the bag as the flowers need to breath and sealing the bags will also seal in the moisture which can cause browning and molding. DO NOT use shopping bags or garbage bags. 5- DO NOT put too many flowers per bag. It will cause more harm and they will NOT arrive in very good shape. A few small flowers per bag and no more than 2 large flowers per bag. 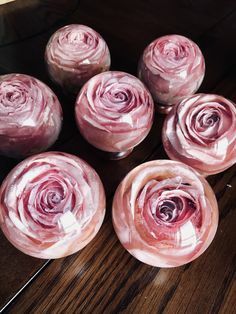 I know that depending on the amount of flowers you are sending it may seem like you have to use a lot of baggies, but if you put to many flowers per bag and they arrive in bad shape because of it, the flowers will not be usable. So if you want more usable flowers then you need to use more bags. 6- Think of a bag of potatoes or apples. If you have one inside the bag that is starting to go bad or brown, it will ruin any other one around it. I know it sounds silly but it is true. Think of your flowers the same way. 7- Please try to separate the flowers and bag the different types together. Example, roses together, carnations together, daisies together etc. 8- It is very important to not mix lilies, glades, astramaris, orchids or tulips with any other flowers as these types of flowers have a lot of moisture in them. If they start to go bad they will ruin the rest of the flowers. 9- If you are sending lilies please remove the stamen, the spiky part in the center that has brown powder on it, as if left on it will stain the flowers and they will not be usable. 10- Do not put anything in with the flowers such as paper towel, water picks or definitely not any green floral foam. Anything that can get wet will cause the flowers to brown and mold. Again just leaving the baggie open will let the moisture out. The paper towel may be dry when you put it in, but once it soaks up the moisture it just holds it in the bag causing the flower to brown. 11- Do not mix dried flowers with fresh flowers. Please bag them separately. 12- Please package the flowers inside a box. Do not ship them in an envelope as they will get smashed and damaged. It is very important that you add in some packing peanuts, tissue paper or newspaper to fill up the empty space in the box so your flowers are not bouncing around in the package during shipping. Believe it or not flowers can bruise. 13- Make sure to include your contact info inside the package so we know who they belong to and who to contact. Email is our primary contact so please be sure to include your email address. 14- We will send out an email within 48-72 hours of receiving your package letting you know the condition your flowers arrived in, photos of your flowers and what the next steps are. We catalog all flowers by the date received and your last name. Please be sure when you are contacting us after the initial email, that you reply to our email that has your info in the subject line. 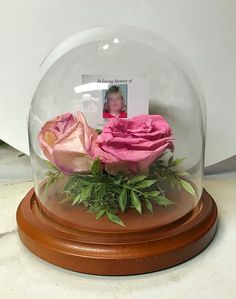 Please ONLY ship your whole bouquet if you are wanting one of our glass dome displays that would encase your WHOLE bouquet, handle and all. If you are just wanting keepsakes made from the flowers then you only need to send us the flowers themselves. If you are sending the whole bouquet then please place your entire bouquet in a box. DO NOT put anything wet in with the flowers, this makes them mold, fast. Wrap the bouquet with paper towel. You will want to add crushed tissue, newspaper or packing peanuts to fill in the box, so your bouquet isn’t bouncing around. Then ship them off, I’d recommend priority mail, UPS or FED-EX. There is no need to do overnight or express shipping, it’s very expensive. Priority mail, or 2nd day will be fine. Also, we do not save the handles and or stems unless asked to do so as we do not have the extra storage space to store all of the handles we receive. Be sure to put your name, address, phone number, email address in the box too!! Even if you have flowers that are already dried, something can still be made with them, as long as there is still color. (jewelry, photo frames, candles). They won’t need to be preserved, we will work with them the best we can. 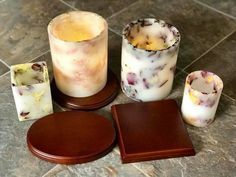 Also just so you can be aware, dried flowers may not come out looking just like the ones on our website as those are freeze dried flowers. The keepsakes will come out the same color as the flowers looked when you shipped them to us. Keep in mind that colors can change and that air dried flowers react differently than freeze dried flowers do. Cut off the stems, and any leaves. The flowers are very fragile when they are dry, so be careful as you are handling them. Wrap the flower/flowers with tissue or paper towel, and put them into a box. Don’t put anything wet in the box. 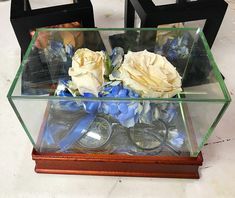 Fill in the empty space in the box with a soft tissue, you don’t want empty space in the box, or the flowers will be bounced around during shipping. 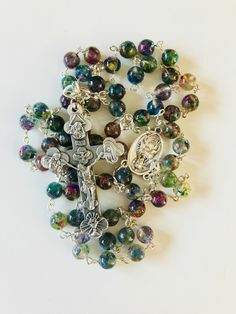 If you are sending other keepsakes, (example- medals, rocks, bugs, coins, etc.) wrap them carefully, and ship them to Celeste. 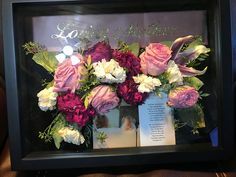 If you are sending silk flowers, just so you are aware, we cannot put them into acrylic. So we cannot make jewelry, paperweights, picture frames etc. 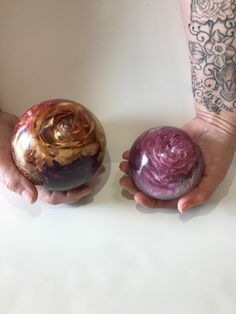 The only thing we could do with them is put them into a shadowbox, hanging ornament display or one of our other displays. They just to not react well with the acrylic and will not turn out. Also, we can not preserve succulents. They do not do well as they shrivel up like a cactus does once it dries out. Please be sure to follow all shipping instructions above as we want your flowers to arrive the best they can!! Please be sure to add us to your address list, so our emails don’t go to spam. When your flowers arrive, we will contact you via email within 4 days. We get a number of packages each day, it takes time to catalog them and start the preservation process. You MUST reply to this email, verifying you understand the order process. For most orders, total return shipping is $10.00 – $25.00, depending on the size of the order. When you place your order, you will be invoiced, your total shipping rate will be stated on the invoice. We send most order via USPS, priority mail. Tracking number will be available. We do our best to package all keepsakes so that they are safe during shipping. However, we can’t control what happens once the package is out of our hands. If we could hand delivery all of the keepsakes we would but that is obviously not possible. We do put insurance on all packages before we ship them. If you receive your keepsakes and there is any damage to them you can file a claim with the post office to get the insurance claim money. Being that these are all custom made keepsakes we can’t always make another one for you. If we have any of your flowers left we may be able to do that. To file a claim you will need to go onto USPS.com and under the help menu is where you click on “file a claim”. They have it all listed there what you need to do. You will need the paid invoice that is included in your package, the original packaging that the damaged keepsake arrived in, the tracking number and the damaged item or photos of the damaged item. On the shipping label is the proof that insurance was added. The post office will be able to look that up also. You do need to file your claim within 60 days of when the package was mailed. The reason you need to file the claim and not us is that you will get the insurance money. If we have extra flowers left of yours then we will be more than happy to make you a new keepsake with what flowers we have left. However you will need to send us the money to cover the cost of the new keepsakes as that is what the insurance is to cover. If we do not have any flowers left then the insurance money is yours to keep. If it is that we do not have any flowers left of yours you can try to repair the damaged keepsake yourself. We recommend using super glue or gorilla glue. Do not try to repair the keepsake until AFTER your claim is finalized. We do not want to frighten you or to make you think that this happens all the time as it does not. 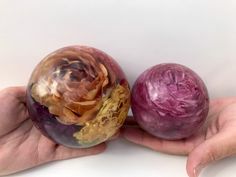 We just want to make sure you are aware that being that theses are custom made fragile keepsakes, they can break.